Alpine WSG (Water Soluble Granule) is an easy to use insecticide. It mixes to a clear, odorless solution that will not stain sprayer surfaces. Proven to kill and control some of the most common insect pests Alping WSG is very safe around pets and children. 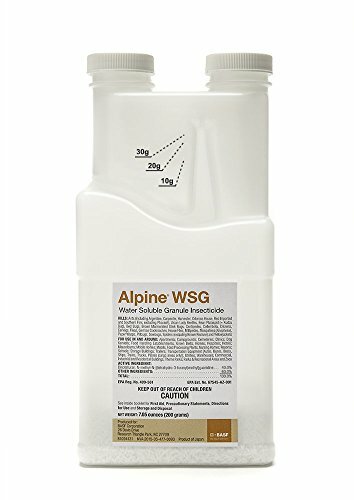 Alpine WSG can be used in and around the following locations; Apartments, Campgrounds, Cemeteries, Clinics, Dog Kennels, Green Belts, Homes, Hospitals, Hotels, Mausoleums, Mobile Homes, Motels, Non Food/Feed Areas of Food Processing Plants, Nursing Homes, Resorts, Schools, Storage Buildings, Trailers, Transportation Equipment, Utilities, Warehouses, Commercial, Industrial and Residential Buildings, Theme Parks, Parks & Recreational Areas, and Zoos. Mixing Instructions: Add about 1/2 of the water to the spray tank. Tear open packet and add contents to the water, the complete filling the spray tank. Agitate the tank until the product is completely dissolved. Refer to The Spray Dilution Chart on the Label for different concentrations.